Mondays are known to be notoriously bad. Nobody likes Mondays, its just how it is. 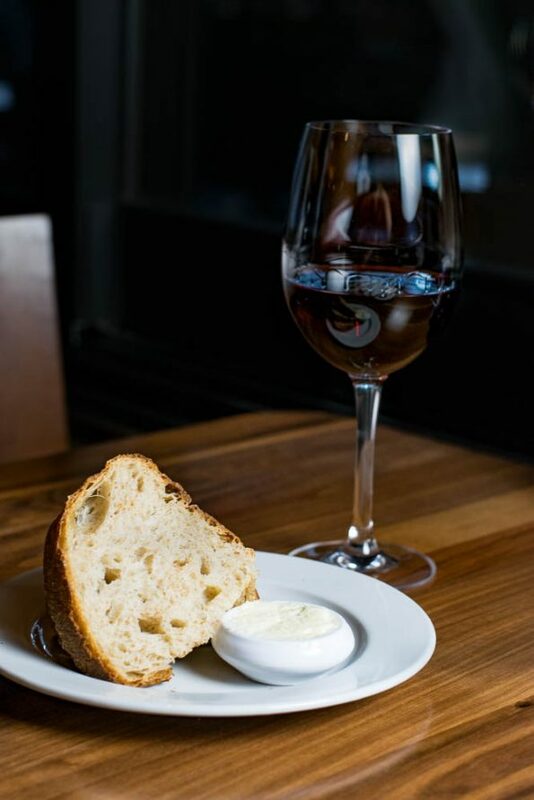 Fortunately, Paul Martin’s American Grill wants to help ease those Monday blues with a fantastic wine dinner deal! Diners get a bottle of wine (from a very large list of selected wines, overall they carry over 100 different wines), 2 field greens salads, and 2 entrees all for $50 (+$15 if you want the NY Strip Steak or Ribeye). We recently headed over to Paul Martin’s American Grill to try it for ourselves! Paul Martin’s American Grill puts a large emphasis on using seasonal, local (when possible), sustainable, and organic ingredients. Everything is made from scratch including the house bread and butter with the former baked fresh daily and the latter whipped with salt in house daily. Paul Martin’s meats are 100% natural, the beef is grass-fed, and the seafood is sustainable. Additionally, the butchering is all done in house. The freshness and attention to quality is apparent in every bite of food. Our meal started with the Field Greens Salad. 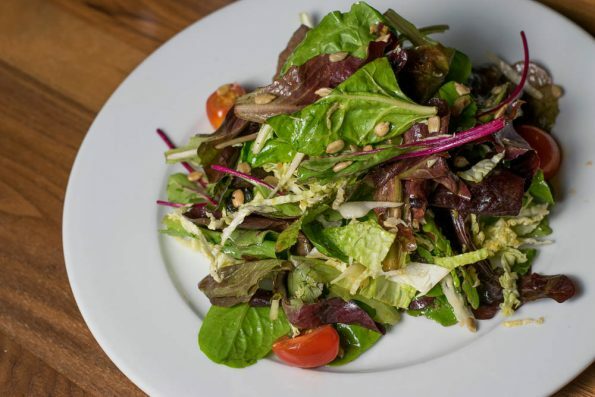 The salad is comprised of spring mix, savoy cabbage, sunflower seeds, tomato, and a red wine French vinaigrette. It may not look like more than a dinner salad but that is absolutely not the case. This salad set the tone for the freshness and quality ingredients that Paul Martin’s prides itself on. The spring mix tasted fresh and not bitter (no old lettuce here) and the tomatoes were super sweet. It was perfectly dressed (not too much dressing or too little) and the dressing the perfect balance of oil and vinegar. If the salad was this good, we knew we were in for a treat with our entrees. 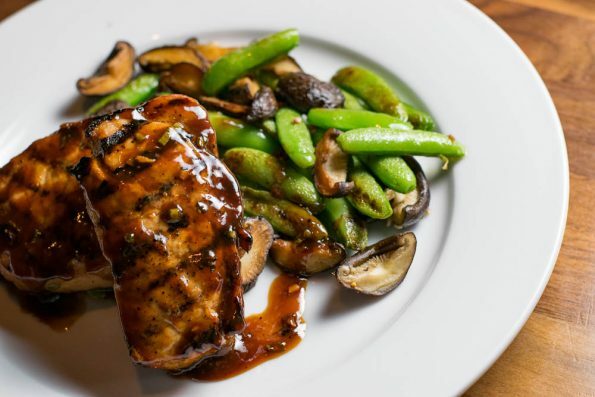 For our entrees, we ordered the Hoisin Marinated Pork Medallions (sugar snap peas, shiitake mushrooms, ginger, garlic) and the Braised Short Ribs (mashed potatoes, horseradish cream, and beef jus). We were floored with how fantastic these dishes tasted. Paul Martin’s aims to serve simple but high quality food that tastes great and they do just that! The pork medallions were some of the juiciest pieces of pork we’ve ever had. The snap peas and mushrooms tasted just as fresh as our salad did earlier. The short ribs were tender and delicious. Say what you want about not noticing the difference between standard beef and grass-fed but there is absolutely a difference and it is apparent in this entree (not to mention the beef jus was glorious). The mashed potatoes were killer! Well seasoned and that perfect balance between creamy and lumpy (we prefer lumpy at home). Paul Martin’s American Grill’s focus on seasonal and quality ingredients is truly emphasized in all the menu items. The menu changes about 4 times a year. They also do specials for various holidays (like corned beef and cabbage for St. Patrick’s Day, which sold out by 5:30pm) and also have other weekday specific menu specials such as Fried Chicken on Tuesdays and Prime Rib on Sundays. Paul Martin’s offers a dining experience that is truly phenomenal, so head over and check them out!